I love these. It is a wonderfully light dinner – perfect for when you want to save plenty of appetite real estate for dessert. Seriously though, they are really tasty and a great ‘gateway’ fish meal for my husband who took a while to entertain the idea of eating anything with gills. Now, this has become one of our favourite weeknight meals. It’s surprising how quick it comes together. Most of the work involves the dicing for the salsa, but this can easily be done while the sweet potato is cooking. I’d be lying if I said I have ever measured the spices I throw into the bowl. These are approximate! Bring a medium pot of salted water to a boil. Meanwhile, peel and roughly chop sweet potato. Cook sweet potato until fork tender. Drain, mash and allow to cool. Addendum: I often roast the potato the night before while doing evening chores. Wrap it whole in aluminium foil, bake at 400F for an hour. It makes this dinner even quicker when the potato is ready. And..one less dish! 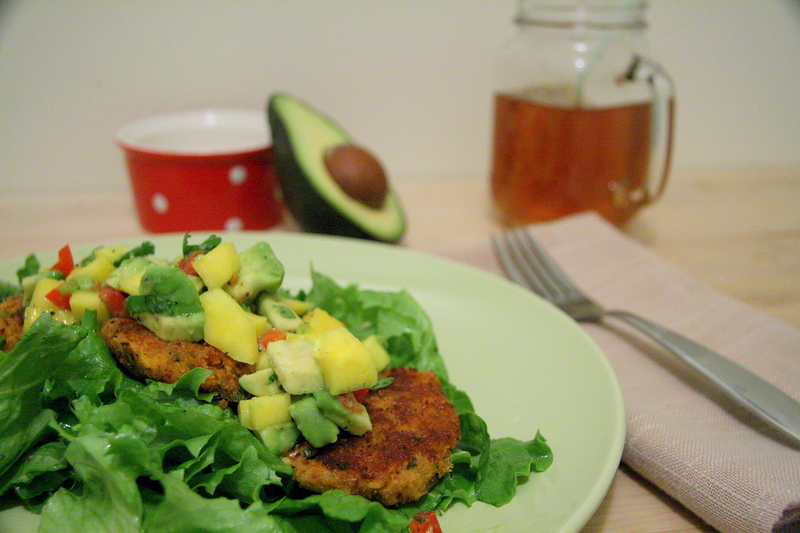 Form mixture into salmon cakes of desired size. We usually get about 10-12 cakes from this recipe. Heat oil in frying pan over medium heat. Spread breadcrumbs on a plate and press cakes into crumbs coating evenly. When the oil is nice and ready, cook the cakes! Be mindful not to crowd the pan and cooking in multiple batches if needed. Flip when there is a nice golden brown crust on the bottom. Don’t rush this; it only takes 4-5 minutes. When both sides are cooked, remove from pan to paper towel. Add more oil if needed for subsequent batches. Keep cooked cakes warm in oven. My favourite way to eat these cakes is as seen in this photo: over a bed of lightly dressed (or naked) greens, topped with a bounty of salsa.